Several Roush Fenway Racing drivers in the Sprint Cup series have contract renewals coming up this season and there has been a lot of speculation about whether some or all would leave Roush for another organization. In reality, it appears this for all intents and purposes a non-story. Not because the drivers involved – Carl Edwards and Greg Biffle are the most mentioned candidates – haven’t performed well enough to seek pay increases or better deals, but instead because there is in large part nowhere for them to go. A slow-to-recover economy, a sport still struggling with attendance and ratings and the lack of new big-money sponsors in NASCAR dampen the driver’s market these days. In all probability, Edwards and Biffle will remain right where they are and the coverage of their impending “decisions” is really little more than window dressing. To go anywhere, first a team must be available. Let’s look at NASCAR’s top teams – Hendrick, Richard Childress Racing, Joe Gibbs Racing and Stewart-Haas Racing. Among them they have three available slots and Hendrick and RCR are already at their four-team limit. That leaves one team at JGR and two at Stewart-Haas. If any such move was contemplated a big-money sponsor or two would be needed to add a team – and at the moment there are no new ones on the horizon. In fact, Stewart-Haas still has sponsorship to sell on its No. 39 team with driver Ryan Newman. In the past, big-name drivers with impressive credentials could almost write their own ticket. It’s just not the case these days. Where once a team could fit the pieces of the puzzle around the addition of a driver, it’s much more necessary now to have those pieces in place before a new driver can be enticed to make a move. And that change in dynamic is likely what will keep Edwards and Biffle right where they are. There has been much discussion in recent years with the sub par attendance at Auto Club Speedway in Fontana, Calif., particularly since the track was given a second Sprint Cup Series race date - in theory because it deserved one. This season, International Speedway Corp. elected to remove one of the speedway's Cup dates and give it to Kansas Speedway. "Honestly I wish all the race tracks would be held accountable for how many people are sitting in their grandstands. I think sometimes there’s just certain places that we go to -- I think this particular track is a good venue that when we first started coming here supported one race very well. Sometimes a lot of people want more and you try to make two races out of it. I always tell people there is no reason to make two mediocre out of one good," he said. After a look at the early winners this season in the Sprint Cup Series, it is becoming clear this year’s Chase for the Cup could be the most competitive yet. That’s not because of where anyone stands in points four races into the season, but rather because of the change made to the eligibility rules of the Chase. The top 10 drivers in points after 26 races qualify for the Chase, plus – for the first time this season – two ‘wild card’ entries, which are the drivers in positions 11-20 in points with the most wins. If there are no winners after the 10th spot, the 11th and 12th entries will revert back to points. But since the Chase started in 2004, there has always been at least one driver who didn’t make the Chase with at least one win. Looking at who has won so far this season and running the whole season – Jeff Gordon, Carl Edwards and Kyle Busch – is there any doubt that if one of them had to get in the Chase on the ‘wild card’ rule they wouldn’t have a chance at the title? Certainly they would have more of chance than a driver who “slipped in” the Chase in the 12th spot in points and hadn’t won a race all season. That’s the benefit of the ‘wild card’ entries – they are more likely to be competitive in the final 10 races than drivers who simply finished 11th or 12th in points. Let’s face it, while there have been good stories of drivers winning their way into the Chase (Jeremy Mayfield) and making up a large points deficit to get in (Matt Kenseth), none of them turned out to be contenders for the championship. While there is no guarantee, the ‘wild card’ rule helps improve the chances the drivers who make the Chase field will be the ones most capable of finding Victory Lane. Is NASCAR 'back' or not? If Sunday's Sprint Cup Series race at Bristol Motor Speedway provides any lessons learned I hope it's this: Three races does not a spectacular season make. Nor do three good races mean the sport has "turned the corner." And it certainly doesn't mean "NASCAR is backkkkk" as some fellow media colleagues so willfully crowed when ratings went up and great crowds were on hand in the season's first three races. Bristol, folks, was a dose of reality. In 14 years of covering NASCAR - two races a season - there were never fewer people in the stands for a Cup race than there were on Sunday. And this is no exaggeration: Some races I have covered in what was then known as the Busch Series drew better than Sunday's crowd. On top of that, overnight TV ratings were off nine percent. That percentage will likely grow when the final rating is released later this week. I understand those who make a living from this sport greatly desiring that it has turned a corner. And along with that their hope the sponsor money faucet will open up. And the race fields will be filled with cars that intend to run the entire race. But wishing it so does not make it so. Three races does not a comeback make in a 36-race season. Nor would three subpar races be reason to put the sport on its deathbed. However, anyone who thinks there isn't a serious problem still out there when one of the sport's most iconic venues is slightly more than half full, has the blinders glued shut. Undoubtedly, these comments will be labeled "negative" and I'll be criticized for wishing ill on NASCAR. Nothing could be further from the truth. Good or bad, exciting or dull, I just want - as Carl Edwards said at Las Vegas - for NASCAR to be NASCAR. Whatever NASCAR is this week, today, is how it should be reported - good, bad or indifferent. Because in the end, it will take all the 'negative' people and all the 'positive' people to fix what's wrong here. Neither group showed up much at Bristol on Sunday and apparently found something else to watch on TV. Before Saturday's Scotts 300 began at Bristol Motor Speedway, driver Jennifer Jo Cobb elected to get out of her car rather than "start and park" it, as her team owner asked her to do. "It feels like such a 'Jerry Maguire' moment. There were rumblings all week about us start and parking this race. I have a commitment to my sponsors, my fans, NASCAR that I won't start and park. I'm very serious about my career and my performance, and I've worked hard to prove it to everyone. The conversation was never had with me until 10 minutes before the race that I was to start and park. I had already bought tires for the race, so you can imagine that this was a blow to my principles and my finances to get this news. "As the owner of 2nd Chance, he has the right to ask NASCAR to black flag me and said he would do that if I didn't comply. There were also rumors that he was going to surprise me and take me out of the car at California. We have a five race agreement that says I am racing for him, which is why I decided to collect Nationwide Series points and not Camping World Truck Series points. "Because of those promises, I made decisions accordingly for my career. So after thinking about it for a few minutes, which there weren't many, I made a decision to walk away. I thank God for giving me the strength to do that. Sometimes that is the best thing to do. I just felt like I owed it to my fans and my sponsors that I'm seeking and to NASCAR that if I say, 'I'm here to race,' that I go out and race." ﻿ Jeff Gordon, who earlier this season snapped a 66-race winless streak with a victory at Phoenix, has generated more on-screen time for his sponsors during television coverage of the first three NASCAR Sprint Cup Series events than any other driver, according to data collected by Joyce Julius & Associates Inc, which has monitored every NASCAR race telecast over the last 27 seasons. However, overall team sponsor exposure fell 25 percent compared to the same point in the season a year ago. After his win at Las Vegas, Carl Edwards made some remarks about the quality of racing that went largely unnoticed. Yet they probably are some of the most important that have been spoken by a NASCAR driver in some time. “I can tell you from the driver’s seat that there are no more exciting tracks to drive on. This place has a lot of character. You slide the car at 200 mph through the corner and there are multiple grooves. I think striving to deliver a product that is impossible to deliver in auto racing is foolish,” he said. “I think we need to be NASCAR. We need to be what we are. Some days we will have races that are more single-file and some days we won’t. The true sport of auto racing is making your car fast, driving in perfectly and having the engine have tons of power. Edwards couldn’t be more correct in his reasoning. Every sport has games with blowout scores, even championship games. Fans of the winning team generally don’t care how their team wins, just that they do. 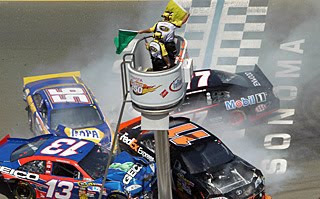 Yet for some reason in NASCAR, it is almost expected that every finish must be down-to-the-wire and a fender-banging affair to be considered “good racing” by many fans and media alike. Because so many people expect that from the sport, NASCAR itself feels compelled to make rules that help assure those kinds of outcomes. In the process, the outcomes too often appear contrived, which inevitably hurts the sport’s perception. Just let NASCAR be NASCAR, whether it’s winning by a lap or racing four-wide across the finish line. The nominees for the 2011 Sports Business Awards, presented by Street & Smith’s SportsBusiness Journal and SportsBusiness Daily were announced on Monday and there were a couple categories with NASCAR connections. George Bodenheimer from ESPN; Chip Ganassi from Ganassi Racing; David Levy from Turner Broadcasting System; Kevin Plank from Under Armour; and Pat Riley from the Miami Heat; have been selected as nominees in the Sports Executive of the Year category. Ganassi Racing, the New York Jets, Orlando Magic, Pittsburgh Penguins and San Francisco Giants have been selected as nominees in the Professional Sports Team of the Year category. The Sports Business Awards recognize excellence and outstanding achievement in the business of sports for the period from March 1, 2010 through Feb. 28, 2011. Winners will be announced at an awards ceremony that will be held May 18, at the New York Marriott Marquis at Times Square. Please click here for the nominees in all 15 categories. Two independent contractor employees of Rick Ware Racing's NASCAR Nationwide and Truck teams were involved in a fatal accident Friday night in Thomasville, N.C. The driver of a Toyota Tundra truck, Dean Shaut, lost control of his vehicle while driving on Ball Park Road in Thomasville and was pronounced dead at the scene, police said. The passenger Stephen Masch was airlifted to Baptist Hospital in Winston-Salem, N.C., with spinal cord and head injuries and is listed in critical condition. Shaut, 44, and Masch, 29, began assisting RWR this season on the Nationwide and Truck teams as independent contractors. Shaut was a 20- year veteran of the NASCAR community as a fabricator and mechanic. Masch is an independent contract mechanic for the RWR's N0. 15 Nationwide team driven by rookie Timmy Hill. “All of us at RWR are deeply saddened about the news and are suffering a great loss over this tragic accident,” said team owner Rick Ware. “We can’t express our condolences enough at a time like this to each of the families and words alone right now just don’t express our thoughts enough." Shaut is survived by his wife, Sandy; stepchildren, Chris and Megan; brother, Rick Shaut; and two nieces. Memorial service is 7 p.m. Friday at Davidson Funeral Home, 858 Hickory Tree Rd., Winston Salem, N.C. Visitation is 5 to 7 p.m. Friday. Memorials may be made to the American Heart Association, 101 CentrePort Dr., Suite 130, Greensboro, N.C. 27409. To see the story filed by Fox 8 TV out of High Point go here. Who's in the mood for some speed this weekend? Charlotte Motor Speedway as well as the NASCAR Hall of Fame, Roush Fenway Racing, Hendrick Motorsports and Joe Gibbs Racing are working together to present the first “Charlotte SpeedFest” from 10 a.m. to 3 p.m. on March 12 at the speedway in Concord, N.C.
SpeedFest activities include: Free tours of Charlotte Motor Speedway and zMAX Dragway and free shuttles offered to the Hall of Fame, Hendrick Motorsports, Roush Fenway Racing and Joe Gibbs Racing; appearances and autographs by NASCAR celebrities, including drivers, Speed TV personalities, Miss Sprint Cup and motorsports artist Sam Bass; NASCAR show cars; video games; kids activities; petting zoo; concessions and live music. Also, several of the area NASCAR shops will offer merchandise discounts in their respective gift shops on Saturday. At the speedway, those who purchase $150 in tickets for speedway NASCAR events will get the opportunity to race their personal vehicle down zMAX Dragway, receive a free one-night hotel stay and a free piece of Sam Bass Racing Art. For more information, call (800) 455-FANS. Late Monday, NASCAR driver Kevin Conway released a statement further describing his run-in with Robby Gordon Friday afternoon at Las Vegas Motor Speedway. Gordon was placed on indefinite probation by NASCAR for his role in the incident. Conway was not penalized. Conway filed a complaint with the Las Vegas Police Department on Friday night. “I don’t mind stiff competition, but I want to make sure the hard facts are told. First and foremost, I love being a part of NASCAR and have worked very hard to earn the privilege of competing in the Sprint Cup Series. On Friday night, Robby Gordon, who has a long history of issues in NASCAR decided to ambush me in the garage area at the Las Vegas Motor Speedway, completely unprovoked. Robby even confronted Joe Nemechek, my car owner, on pit road during Cup Series qualifying shoving him and telling him that he was looking for me and going to assault me. We have many witnesses including a crew chief that signed a police report documenting the truth of his physical attack on me. To read the original story about the incident, go here. Who's hanging out with Chad Knaus? So, who's been hanging out with Chad Knaus? Turns out, Danica Patrick. And it's yet another step in her NASCAR learning process. Patrick spent part of Friday's Sprint Cup Series practice at Las Vegas Motor Speedway standing atop Jimmie Johnson's hauler with Knaus, Johnson's crew chief, listening in on the communication between Johnson and Knaus during the session. "I've gotten to know Chad over the last year or so. Actually from Daytona last year, the first time we got together and went out to dinner. We get along really well. He told me I needed to get over to the Cup garage and check it out and that they had a headset for me and I could listen in," Patrick said. "For me, it's really interesting to hear the drivers to hear how they talk about the car and how they describe it. Also, potentially, being able to determine what things are important to the car and what you don't need to worry about. "It's just all learning for me. I wouldn't say I went and listened and felt I needed to make a change to the race car or do something completely different. It's just more knowledge and more education and how they talk about the car." So far, NASCAR’s new policy of limiting drivers to earning championship points in one series seems to have several unintended consequences. A grand total of zero points were earned by the drivers who won the first five NASCAR races of the season, including the Daytona 500. That may be a statistical oddity, but there also seems to be a growing uproar over how ESPN covers the emerging championship battle in the Nationwide Series, which is likely to produce many race winners this season not running for the title. Let’s be clear: NASCAR’s new policy ensures there will be a new Nationwide Series champion this season, but nothing it did ever guaranteed anybody new would win the series races so long as those who have been participating in it continued to do so. In other words, it’s perfectly possible for the Nationwide champion this year to have won zero races. Now, some seem to think ESPN is obligated to produce almost separate coverage of the drivers in each race running for the championship but perhaps not in contention for the win. Networks sign up to broadcast and cover races – not points standings. This week’s race is in Las Vegas, not this week’s championship battle. The last thing I want is for a network to feel compelled to produce and cover “fake drama” totally irrelevant to what is taking place on the track. We already have a Chase in the Sprint Cup Series for that, thank you. Fans don't buy tickets to sit in the stands, calculator in hand, to see how the points play out. They watch to see who wins the race. The new NASCAR policy may have changed who wins a series title but by no means did it guarantee new race winners or alter the way a race should be covered. If that’s what NASCAR wanted, it should have come up with a better plan. Jimmie Johnson, a four-time winner of the Kobalt Tools 400 event at Las Vegas Motor Speedway who has won the past five NASCAR Sprint Cup Series championships, is a heavy favorite to win in Sin City again this weekend. Although winless in the first two races of the 2011 campaign, Ed Salmons, Race and Sports Manager at the Las Vegas Hilton Super Book, has tabbed Johnson as the favorite at 9-2. The most recent winner, Jeff Gordon (who snapped a 66-race winless streak last weekend at Phoenix), is listed at 10-1 and Daytona 500 winner Trevor Bayne is posted at 100-1. Las Vegas natives Kyle and Kurt Busch are listed at 6-1 and 12-1, respectively. Kyle Busch currently leads the Cup standings.